Cut WAN costs, improve performance, increase security – software-defined wide area networks (SD-WAN) seem to do it all, but can they -- really? Find out as we take a hard look at the myths and realities of SD-WAN. 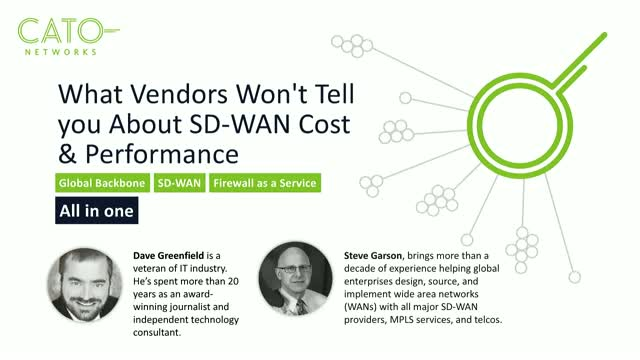 In this webinar, Steve Garson, President of SD-WAN Experts, is interviewed by Dave Greenfield, Cato’s secure networking evangelist, about the practical questions you should ask when evaluating any SD-WAN. What aspects of network performance can SD-WAN really improve? When is service insertion and service chaining needed? Can SD-WAN really reduce WAN costs? Why is security still a problem for SD-WAN even though they encrypt all traffic? If you are considering deploying SD-WAN in your network, you probably hear a lot about its benefits. But, you may be unsure what it will take to move from your legacy MPLS and VPN network to SD-WAN. What problems will you face and how will you tackle them? From India to Belarus, organizations are tapping software development talent in emerging markets. These developers often work outside of company offices, leading to four IT challenges that can undermine developer productivity, render cloud-based versioning systems and repositories unusable, complicate onboarding new developers, and increase risk. Learn from the experiences of three IT pros supporting distributed development teams, and how Cato Cloud solves those challenges. What factors will impact enterprise network design and implementation in 2018? To find out, we surveyed more than 700 enterprise IT professionals about what drives, supports, and inhibits WAN transformation efforts. Join our webinar as Dave Greenfield, Secure Networking Evangelist at Cato Networks, discusses the research findings. He’ll be joined by Steve Garson, President of SD-WAN Experts, who’ll bring his real-world insight from more than a decade of building SD-WANs and enterprise WANs. SD-WAN is all the rage in enterprise networking these days. IT teams are excited about the opportunities SD-WAN creates to transform their WAN to become simple and agile, while improving security, and reducing costs. As you review and look at your WAN challenges, we would like to share insights and takeaways, following hundreds of SD-WAN customer deployments worldwide, to better aid and inform your enterprise network decisions. Enterprises of all sizes are awakening to a big shift in their legacy Wide Area Networks (WANs). Emerging technologies like SD-WAN are targeting the cost and complexity of established approaches like MPLS and Site-to-Site VPNs. Globalization, the move to cloud datacenters and applications, and the increasing velocity of security threats, demands IT to move faster and do more with less resources. In this webinar, WAN expert, Jim Metzler founder of Ashton, Metzler & Associates will discuss his recent research “The 2018 Guide to WAN Architecture and Design: Key Considerations when Choosing new WAN and Branch Office Solutions”. Ofir Agasi, Director of Product Marketing at Cato will review pertinent case studies and strategies used by global and regional enterprises to adapt their networks to meet today’s business challenges. Firewall as a Service, recently recognized by Gartner as a high impact emerging technology in Infrastructure Protection, presents a new opportunity to reduce cost, complexity and deliver a better overall security for the business. As companies shift to the cloud, many are embracing Microsoft Office 365. But traditional wide area networks (WANs) were never designed for the Office 365 or the cloud. Today’s WAN adds too much latency, depending on deployment. Security becomes an issue with branch offices. Costs can escalate substantially. Join us on September 13th, 1:00 PM EST or September 14th, 10:00 AM BST, as Steve Garson, president of SD-WAN Experts, and Dave Greenfield, secure networking evangelist at Cato, take a practical look at how to build the right WAN for your Office 365 deployment. What components of Office 365 cause problems for networks and why? What are the 5 architectures for deploying Office 365? How do the 5 architectures differ in terms of security, performance, reliability, and costs? What are the best practices for deploying Office 365 across the WAN? SD-WAN represents a new and exciting opportunity to transform the costly and rigid enterprise WAN. It promises to make your wide area network more agile, boost available capacity, improve resiliency and user experience, and reduce MPLS costs. Beyond these immediate benefits, enterprises need to address the changing role of the WAN itself. As enterprises increasingly move to the cloud, expand the mobile workforce, and need a secure path to the internet, the WAN must now support a growing set of business needs. What are the critical capabilities you should consider when looking to maximize the business impact of WAN transformation project? User complaints about slow VPN access have been with us forever. Mobile users struggle to gain global access to business applications using legacy mobile VPN clients. They rely on the slow public internet, with its convoluted global routing and high packet loss. Traditional VPN architectures are also incompatible with cloud datacenters in services, such as Amazon AWS and Microsoft Azure, and cloud applications, such as Office 365. The need to force all traffic through a physical chokepoint, a datacenter firewall, impacts performance and the user experience. Alternatively, directly connecting to the cloud bypasses corporate network security, leading to no visibility and control. SD-WAN promises to make your network simple, agile, secure, optimized, global, and affordable. As you consider your options you may be looking to your legacy network service provider to “bundle” SD-WAN with the current service. How agile and simple will your SD-WAN be if it works like the existing WAN services provided by legacy service providers? Will it be self-service or do you still need to open a ticket for every move, add, and change? How will your security evolve to leverage direct Internet access at a branch? Can your service provider deliver cost-effective, easy-to-manage, network security anywhere you operate? How will you connect remote and international locations into the SD-WAN? Will you still need to use expensive MPLS to guarantee latency and packet loss? We want to share with you a vision for SD-WAN that was built to deliver on the 6 promises of SD-WAN. What are the challenges in realizing the transformative impact of SD-WAN on your network. How a new SD-WAN architecture converges global backbone, firewall as a service, edge and global optimization, and self-service management to dramatically reduce the cost and complexity of enterprise networking. Real-life examples and case studies of how enterprises of all sizes use Cato Networks’ SD-WAN to securely connect their global and regional locations, mobile users, and cloud resources. Since the introduction of software-defined wide area networks (SD-WAN) small to medium-sized enterprises (SMEs) have had to consider a bewildering array of features meant for large organizations. What capabilities does an SME really need to consider when evaluating an SD-WAN? In this webinar, Steve Garson, president of SD-WAN Experts, and David Greenfield, Cato’s secure network evangelist, will answer some of the fundamental questions SMEs face when they evaluate SD-WANs. Bonding vs. SD-WAN - what's the difference? Service insertion - do you need it? Load balancing - which type is right for you? Application performance - what features should you be considering and when? Security - is IPsec enough? As cloud migration becomes the norm for IT, enterprises of all sizes need to connect, secure and manage complex physical and cloud datacenters. This is a significant challenge for most organizations especially when multiple datacenters, mobile users and remote locations are involved. To ensure secure access to cloud assets companies tend to enforce trombone routing through existing perimeter firewall that impacts their users experience. Security point solutions may lead to fragmented policy with no real visibility and control. How can organizations securely connect all resources: physical, mobile and cloud? The Future of SD-WAN. Today. Cato Networks provides organizations with a cloud-based and secure global SD-WAN. Cato delivers an integrated networking and security platform that securely connects all enterprise locations, people, and data. Cato Cloud cuts MPLS costs, improves performance between global locations and to cloud applications, eliminates branch appliances, provides secure Internet access everywhere, and seamlessly integrates mobile users and cloud datacenters into the WAN. Based in Tel Aviv, Israel, Cato Networks was founded in 2015 by cybersecurity luminary Shlomo Kramer, co-founder of Check Point Software Technologies and Imperva, and Gur Shatz, co-founder of Incapsula.